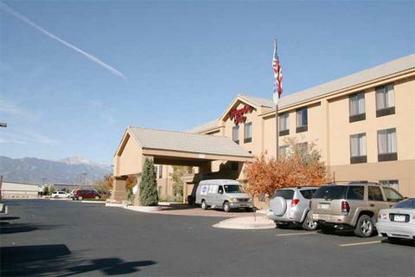 Hampton Inn Colorado Springs-Airport is 2 miles from the Colorado Springs Airport and within 15 minutes of downtown and most major attractions. The World Arena, Olympic Training Center, and Seven Falls (with scenic views of 7 waterfalls) are all within 9 miles of the hotel. Within 2 miles you can dine at Olive Garden, Hops Brewery, Red Lobster,Texas T-Bone. We feature 80 rooms, gym, indoor pool, and whirlpool. Amenities include complimentary continental breakfast, in-room coffee maker, and TV with cable. We also offer connecting rooms, cribs, hair dryers, irons, and Park 'n Fly packages. Laundry/valet services, guest laundromat, meeting/banquet facilities, audio visual equipment and refrigerators are available for a nominal fee.